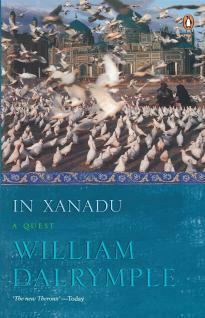 Recently, while browsing through a book store, I found “In Xanadu: A Quest” by William Dalrymple, and wondered that being a fan of his work, how did I not read one of his earliest work? Without wasting any further thought, I bought the book and not for a second, I was disappointed with it. This book was very different from the William Darlymple I am use to read. Here, we have young author, right in the middle of break up, making trip in the modest university grant, with an ambition to become a writer. However, his style of writing is very similar to later works. He does not try too hard to dramatize or metaphorize his adventures, stick to mono-tone (which does not imply boring) & mixes his journey with regular dose of history(which is his game). Younger Darlymple might have been more critical to his older self, like in one instance in the book, he mention his un-approval for urbanization (or Electric-wirization) of Jerusalem or his dislike of Turkey’s “too good for tourist” machoness. Overall, I recommend In Xanadu if travel and history excites you. I rated it 4 out of 5 stars in Goodreads. Oh! also Merry Christmas friends, wish you all have a great time on holidays.